Given that this was my fourth visit to Club 33, the "secret" restaurant at Disneyland (yes, some of the magic has been lost on me! ), please see here for some background information about the place. You can view plenty of interior photos in my previous posts: 2006, 2007, and 2008. One thing I did do differently this time around, though, was to invite other bloggers, as well as some readers, to come along with me. Bloggers included Andrea/Scot of The Foodie Traveler, Matt of Dig Lounge, Sam of LAist, and Wandering Chopsticks, while kevinEats followers Peter and Ravi were also in attendance. Another change this time around was that instead of brunch, we were having dinner. This meant no buffet spread and no visits from Mickey, but rather, a four-course meal. 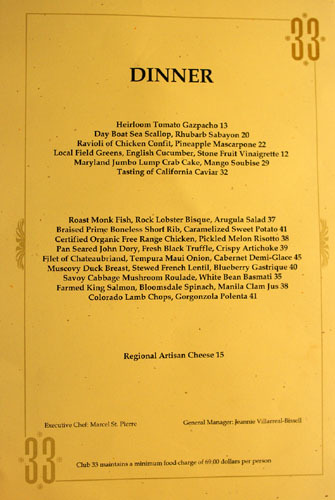 Given that we were a rather large group of about three dozen people, the menu was decided beforehand, with the only choice being a selection of fish or steak for the main entree. Total cost, paid ahead of time, was $117, inclusive of tax, tip, and non-alcoholic potables (Perrier and Smartwater, mostly). 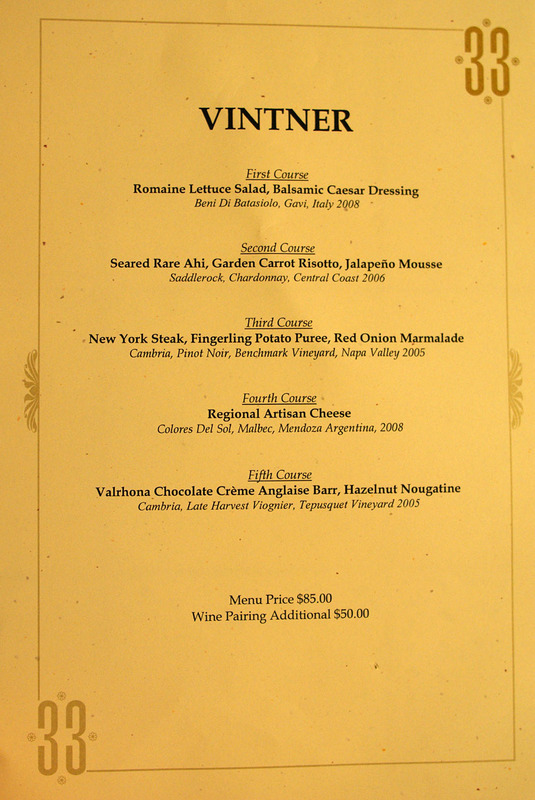 The menus above, thus, were mostly for reference; click for larger versions. 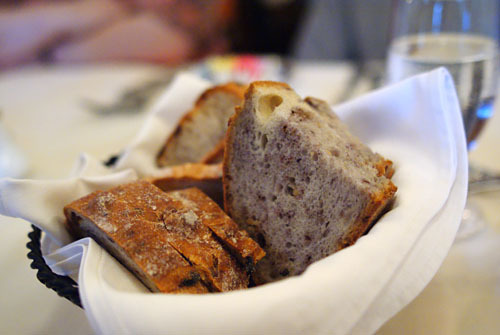 A serviceable walnut-olive loaf was the bread on offer. The salad starter was a bit more interesting than I'd expected. 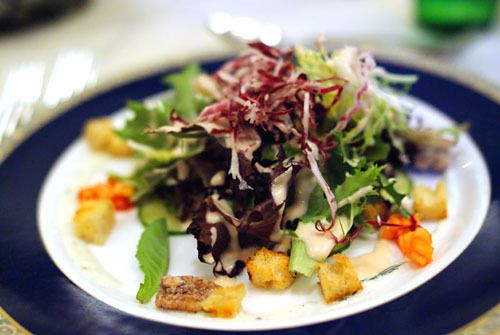 The variety of greens lent some textural variation, and their bitterness was tempered by the sweetness of the dressing, as well as the "candied" croutons and nuts, while the cucumber provided a touch of coolness. Not bad. 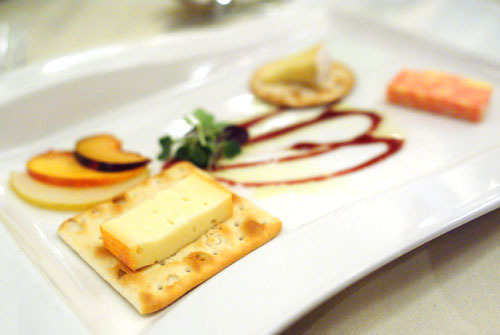 Next: a trio of cheese, served with crackers, stone fruit, and a Port reduction. In foreground, we have Chaumes, a semi-soft cow's milk cheese from Périgord, France; it was supple and savory, full-bodied yet mildly-flavored, but unmemorable. Second was the Elderberry Derby from North England, a semi-firm pasteurized cow's milk cheese with a smooth texture and buttery, mellow savor, accented by a sweetish tang from the addition of elderberry wine. It's a subtype of Derby, a cheddar-esque group of cheese that also includes the popular Sage Derby. Finally was the Brie, a very well-known and well-liked soft cow's milk cheese. Creamy, luscious, salty, with a slight tang, it was textbook Brie, and great with the fruit. Overall, a delicious, but very safe, selection of fromage. 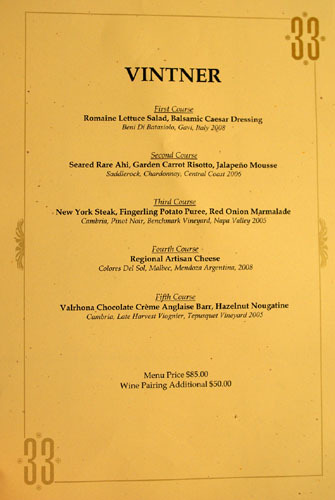 I did find a bit strange, however, that the cheese course was served at the beginning of the meal. Given that I've eaten the Chateaubriand here on two prior occasions, I went with the Dory this time around, a lean, firm-bodied fish with a nicely crisp exterior. It was actually surprisingly tasty, albeit a bit unpolished, with a delectable saltiness tempered by the greens, while the artichokes provided a lovely accompaniment. 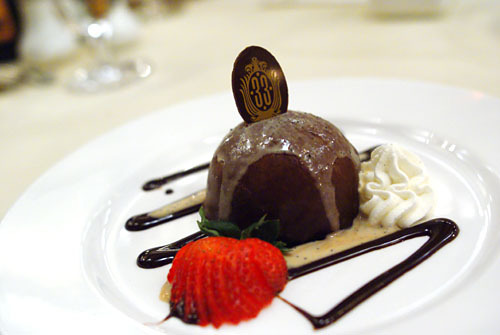 Club 33 seems to always have some form of this dish on the menu. 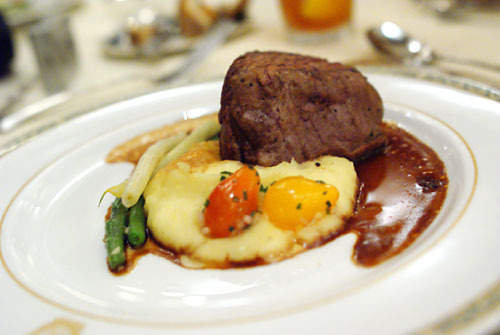 I didn't get to taste the filet, but people around the table seemed to be enjoying it well enough. Andrea, however, did mention that the sauce was a bit too strong, overpowering the beef's natural sapor. 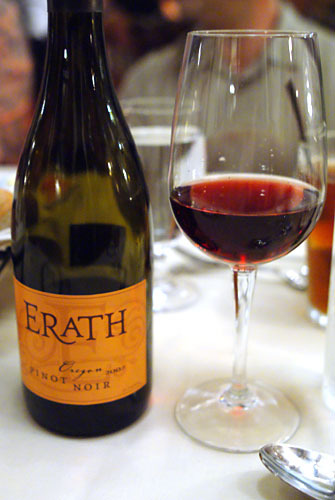 At this point, Andrea and Scot shared some of their 2007 Erath Pinot Noir, Willamette Valley, Oregon [$35]. I thought that it was decent enough, a light, uncomplicated, easy-drinking, everyday pinot with strawberry and cassis on the nose, leading to crisp notes of light red fruit on the palate. Andrea described it as "passable." Disneyland is known for its so-called Hidden Mickeys, and it looks like one made its way onto my plate here, as evinced by the first photo. 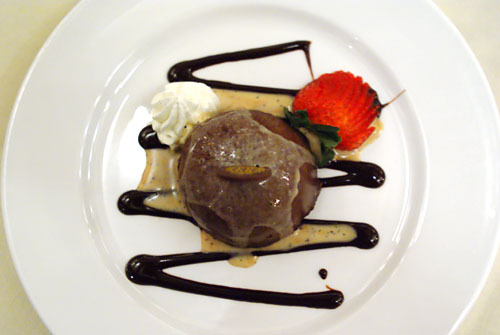 In any case, we were quite blown away by this immensely rich and heavy, incredibly chocolate-y "bombe;" it was so prodigious, in fact, that most of my fellow diners could only consume about half of it! Its potency was mitigated by the application of whipped cream and strawberry, but the accoutrements could only do so much. I didn't get much of the purported Kahlua, which I think would've helped in balancing out the monstrous monolithicity of the chocolate. All in all, I'd say that Club 33 was a bit more refined, a bit more polished at dinner than at brunch, though I'll admit that I do miss the all-you-can-eat buffet (where one can load up on cocktail shrimp!). But again, you don't come to Club 33 solely for the victuals, you come for the secrecy and the swank, the panache and the poshness, the ability to say "I've been." 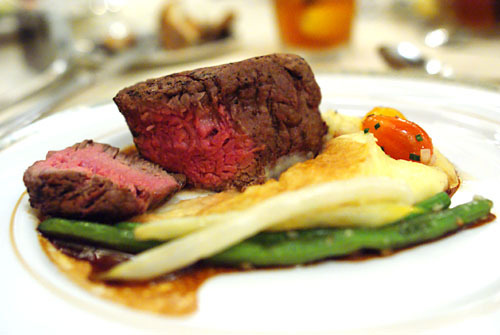 It's a great experience, one that you should jump on if you have the chance, but the best food at Disneyland still resides at Napa Rose. 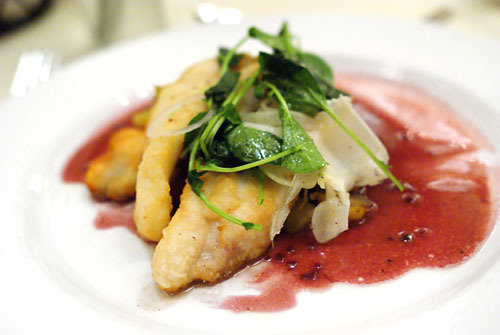 The plating does look more refined than your previous visits. 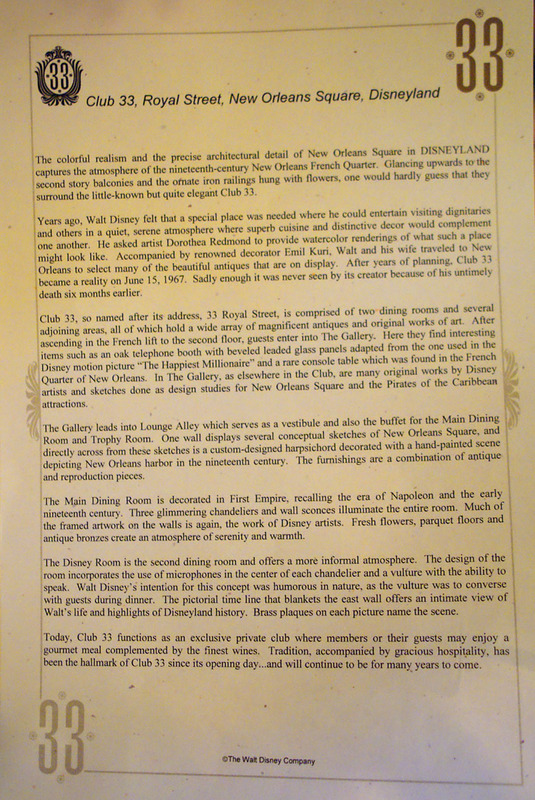 Plus the menu looks remarkably different from anything else I've seen of Club 33; They did away with that old school typewriter font! 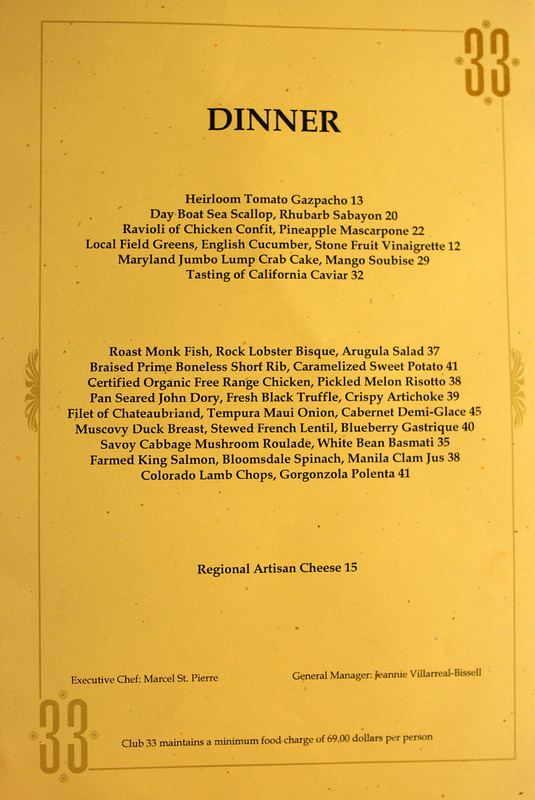 Could it be that they've revamped the whole restaurant and/or brought in a new chef since the last time you were there? Did the quality of the food seem different? Also, I thought the cost of dining at Club 33 was fixed (to cover your "free" admission into the park), so am confused why there are prices next to the items. Or is that just the way they do it for the buffet lunch? What fun. Thanks for the coverage of something I have no intention of ever doing but am still kinda fascinates me. Love the photos of the interior on previous visits, especially the urinals. Hilary: The chef remains the same as before actually: Marcel St. Pierre. And I didn't notice an appreciable difference in the quality of the food either. I think the increased refinement on this visit really had more to do with the fact that it was dinner instead of brunch. 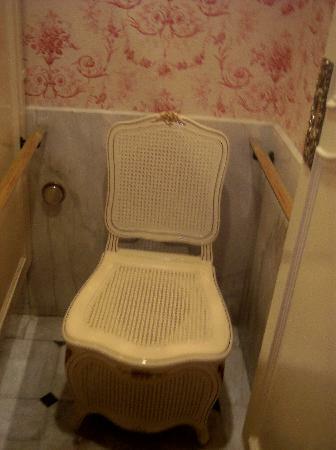 Liz: If you liked the urinals, you should really check out the women's toilet: yes, it's made out of a chair! As long as the costs add up to the minimum amounts you are o.k. If not I've heard that the member runs the risk of the cost difference being charged to his or her membership.